EJIL: Talk! 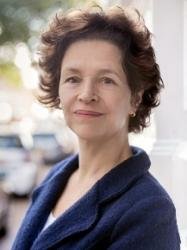 – Do We Need Another Database of International Law Documents? Home Announcements and Events Do We Need Another Database of International Law Documents? Do We Need Another Database of International Law Documents? Online databases and repositories appear to be the new golden calf of law publishers which have invested a lot of money in these new academic products. Some publishers secured an early lead position in this market while others are now catching up. From the perspective of the academics that contribute to the developments of such tools, the market still appears to be in development and below saturation. Yet, it cannot be excluded that the continued development of databases ends up cannibalizing publishers’ other, more traditional, products, such as reference books and law reports. This is however a debate for another day. For now, it suffices to note that users — whether students, researchers, practitioners — seem to value international law databases; at least as long as their institution can afford to provide them with access thereto. It is against this backdrop that the recent launch of Oxford International Organizations (OXIO) – which was celebrated on the occasion of a well attended event hosted by the Graduate Institute in Geneva – raises the question of what epistemic and practical gaps which this new database of documents and annotations specifically dedicated to international organizations can potentially fill. This is why, in the following paragraphs, we inquire into some of the disciplinary assumptions upon which the development of such a product rests, especially in relation to the law of international organizations (1), as well as the concrete benefits which users can draw from OXIO (2). 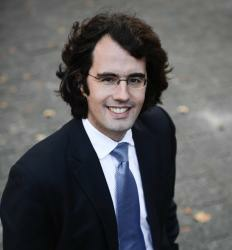 Consolidating the Law of International Organizations? The creation of a new database specifically dedicated to the law and practice of international organizations inevitably raises a number of foundational and conceptual questions. Indeed, while there may be a general consensus that international organizations, first created at the end of the 20th century, have come to proliferate since 1945 and today play an increasing role in international society, the actual extent of this role and the implications for international law remain the object of intense debate. For instance, it is not self-evident that there is such a clearly defined and epistemologically coherent area of law like ‘the law of international organizations’, distinct from both general international law and from individual institutional and treaty regimes. Moreover, the way in which the law and practice of international organizations is approached and theorized varies greatly. For some, the primary question and aim of any inquiry into the law of international organizations is to focus on the institutional arrangements and procedures of specific organizations; or on possible similarities between such regimes. Others would seek to extract general legal constraints or common institutional patterns with a view to postulating general principles applicable to all organizations. Still others would focus on the effect of general international law in its application to organizations as ‘global actors’. In this context, it is not surprising that the study of the law and practice of international organizations has grown ever more multifaceted, or arguably, cacophonic. And yet, although OXIO can itself be co-constitutive of the field and of the variety of understandings thereof, its creation does not prejudge the question of whether there exists a coherent ‘field’ like the law of international organizations. OXIO similarly can accommodate the contestations of the epistemological autonomy of the field as well as the various perspectives from which the law and practice of international organizations are examined, discussed and criticized. True to say, the mission of OXIO is not without paradox. On the one hand, it capitalizes on the current popularity of the law and practice of international organizations among researchers and practitioners. In fact, the production of new articles, research monographs on the law and practice of international organizations, as well as the updates to the field’s foundational textbooks continues unabated. OXIO reinforces and consolidates this scholarly vitality and proliferation. On the other hand, OXIO is launched at a time in which support for the field’s main object of study, i.e. international organizations, seems to be plummeting to an all-time low inside and outside academic circles and across disciplines. Indeed, while for a long time organizations were seen as the embodiment of progress and a cosmopolitanism of sorts – not least due to the idea that the allocation of power and authority along functional rather than territorial lines seemed to mitigate many of the political and theoretical challenges of international affairs –, the 21st century has now found in international organizations the cause for many of the problems in this world. In the light of the foregoing, one may wonder whether the omnifariousness of the study of the law and legal practice of international organizations coupled with the plummeting popularity of international organizations in political reality render the creation of a new database specifically dedicated to international organizations moot and futile? We think the opposite view is warranted. A field that bespeaks conceptual diversity and concentrates its efforts on the actions of elusive and sometimes contested global actors can only benefit from a new tool, one that is intended to be a central repository of the legal practice pertaining to international organizations. In particular, it is argued here that a database like OXIO, by centralizing the law and practice of international organizations in one single database, can help turn the ‘cacophony’ into a healthy pluralism and constitute a platform for a variety of distinct perspectives on the law and practice of international organizations. At a time when international organizations are contested, OXIO can provide researchers with innovative instruments to explore, unearth, report, reflect on, evaluate, justify, rehabilitate, repudiate, and criticize what international organizations do and where they stand as political and legal (f)actors in the global community. It is with this in mind that OXIO has been designed to be not only a resource for the documents of international organizations, but also a substantive repository of thoughts. OXIO is therefore built to be a database which captures, and comments upon, the role of international organizations, their contribution to norm-creation and law-making in various substantive areas of international law, as well as the field of international institutional law in particular. Accordingly, OXIO does not only contain resolutions and decisions of organizations, draft normative texts prepared within the framework of organizations, and constituent instruments of organizations, but also court decisions relevant for the institutional law of organizations, as well as the occasional treaty to which an organization is a party where this brings light to issues of institutional law. As a result, OXIO arguably has the potential to offer unprecedented overview and access to the actual practice of organizations while also revitalizing fundamental questions of theory and doctrine. Ultimately, OXIO enables a field caught between disciplinary cacophony and growing contestation in practice of its object of study, to consolidate itself through new reflexive and investigatory tools. What do users gain from OXIO? The rest of this post provides some snapshots of how OXIO accommodates the variety of distinct perspectives on the law and practice of international organizations as well as the contestation of international organizations, while also being a repository for practice, theory and doctrine. Each headnote contains a concise Summary of the document, relevant Background information, important Analysis and a helpful section which examines the Impact of the document on international law and international affairs. Perhaps an obvious contribution expected of OXIO are its commentaries on the constituent documents of international organizations. This has never before been undertaken in such a systematic and therefore useful manner. 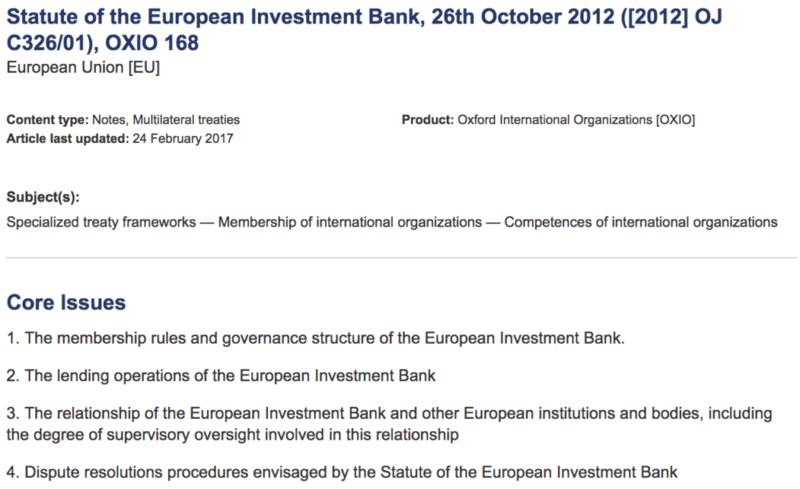 An exemplary sample of this is the Headnote on the Statute of the European Investment Bank which, in addition to reporting on a little examined constituent document, looks at the relationship of the EIB with other European institutions. OXIO seeks to comment upon the relations between major international organizations too, such as the United Nations and the International Criminal Court which, it turns out, emphasizes a lack of a hierarchy between the two bodies. Such an agreement underlies many of the important issues of today, including the referral of the Darfur situation by the UN Security Council. 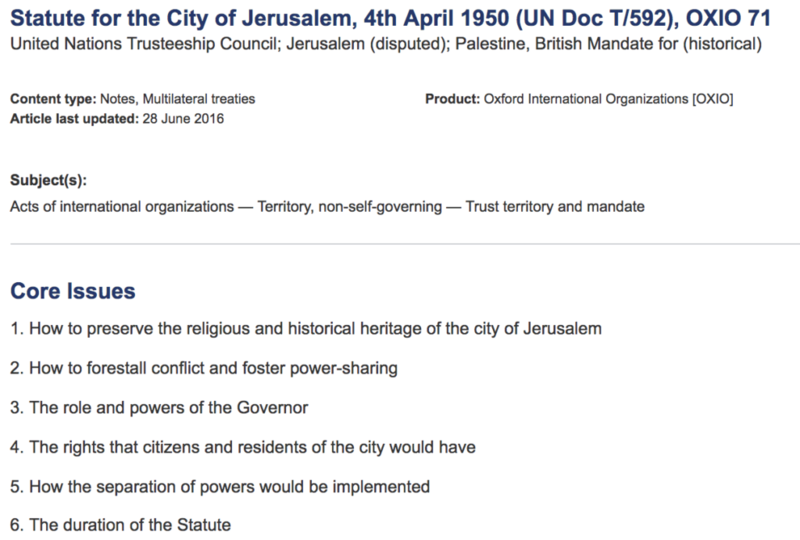 Significant historical documents feature in OXIO, including this headnote on the Statute of Jerusalem. It contains crucial insights into a continuing political situation nd it provides a snap shot of the thinking in the 1950s regarding the potential for a solution. OXIO looks at issues that would be typically classified as institutional law, including the following headnote analysing issues to do with membership and suspension in the situation of Egypt following a military coup. International organisations contribute enormously to ‘bread and butter’ issues of international law such as international peace and security. 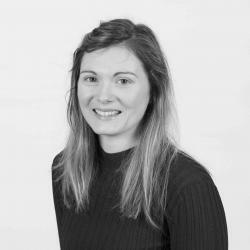 There are an increasing number of actors on the scene with roles in maintaining peace and ensuring security, which at times has led to conflicting legal interpretations. 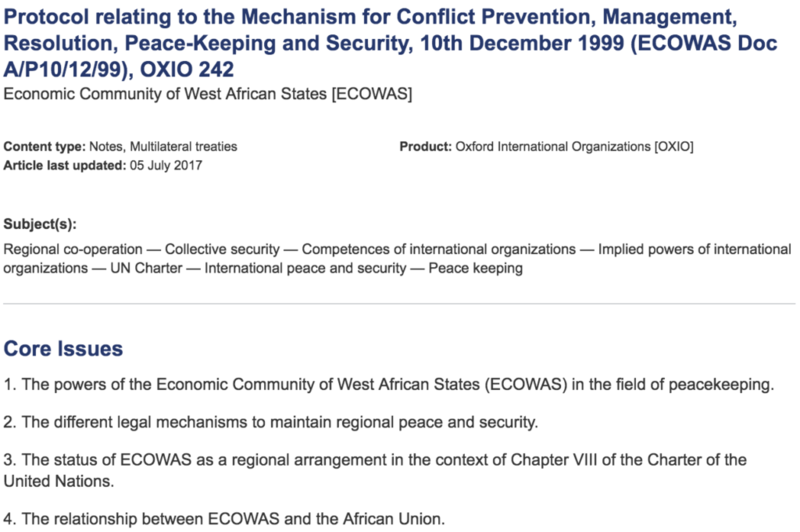 An important document on this issue is the ECOWAS Protocol on a Mechanism for peacekeeping and security on the continent of Africa. The following headnote examines the mechanism and situates the debate in the context of Chapter VII of the UN Charter. Lastly, OXIO looks at issues which are dominated by specialised international organizations and experts, while not always addressed in, or fully appreciated by, mainstream international legal scholarship. 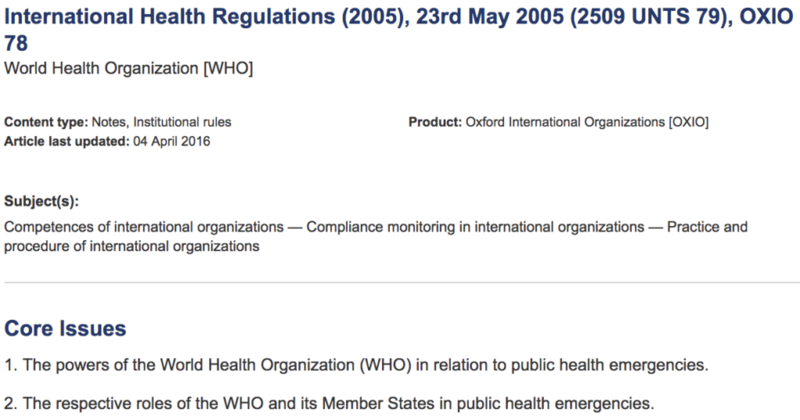 These International Health Regulations are just one illuminating example of the increasing powers of international organizations in the field of global health law. Do we need another database of international law documents as the one introduced here? Irrespective of one’s self-perceived interest in the practice, theory and doctrine about international organizations and the contestation thereof, taking a look at the database – which has open access until July 2018 – may be the simplest way to answer that question. Comments Off on Do We Need Another Database of International Law Documents?